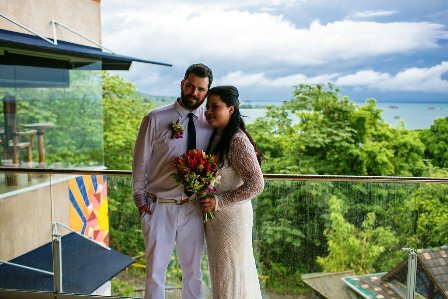 Danette and Justin came to Manuel Antonio with a group of friends to celebrate their wedding. They all stayed at Punto de Vista which is a amazing villa overlooking the ocean. They were able to enjoy the beauty and take advantage of the many opportunities of this area offered for a week. 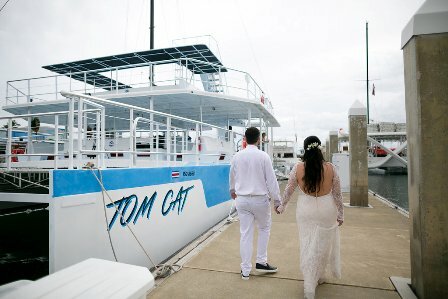 Danette & Justin wanted a wedding that would be different and opted to “tie the knot” on the Tom Cat. 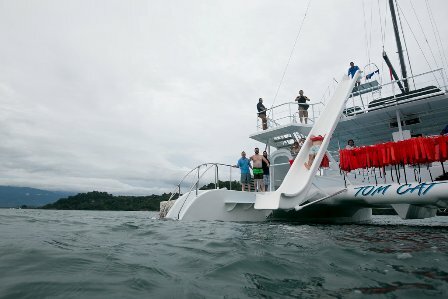 This was the maiden voyage for this catamaran. 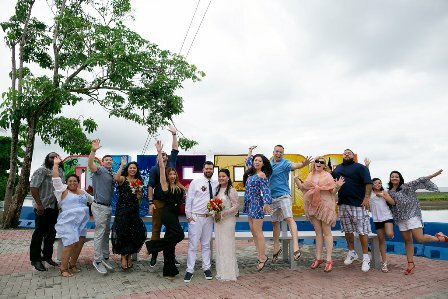 Before boarding they stopped at the new Quepos Sign for a photo of the group. Their photographer Caroline Jarvis captured all the activities during the week. 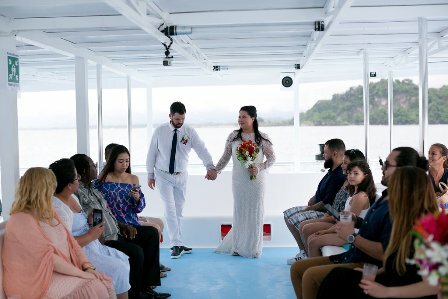 The ceremony took place at sea aboard the Tom Cat. 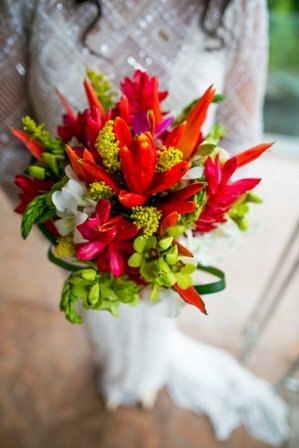 The decor was tropical and Danette carried a bouquet with bright colored flowers. 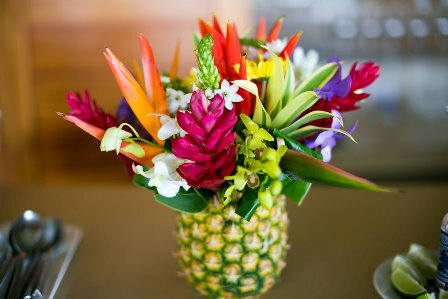 They even had a centerpiece with a pineapple base. 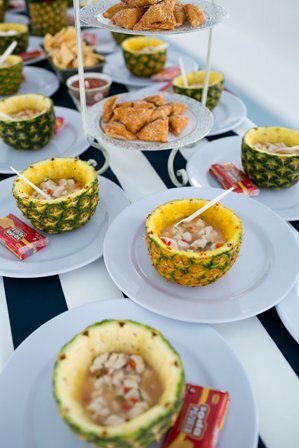 The menu featured ceviche, empañadas, fish and chicken along with tropical drinks. 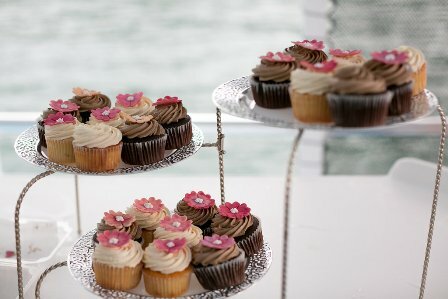 Rather than a wedding cake the guests were treated to cupcakes.
. 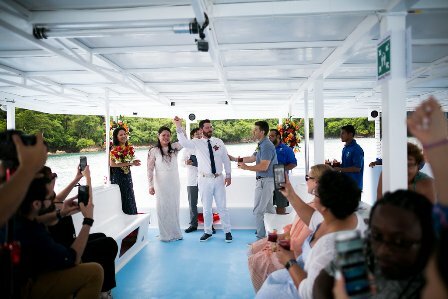 The great thing about getting married on a catamaran is that after the ceremony everyone went for a swim in the ocean. 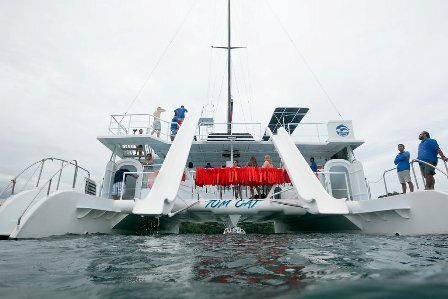 The Tom Cat features two large slides and life vests were passed out to everyone. Coming into port we were greeting by the beauty of the marina. This is an area that has recently been added to Quepos. 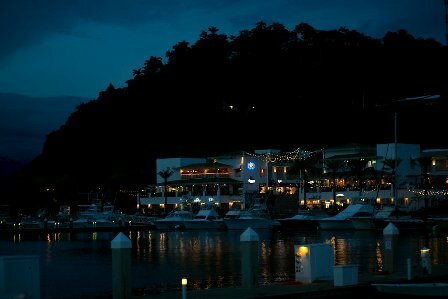 It’s a great place to eat, drink and have a good time. 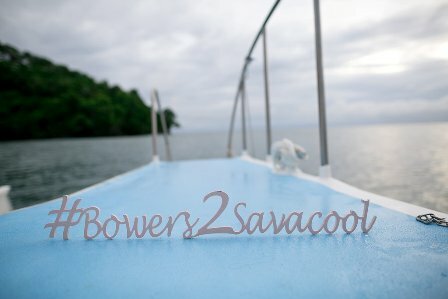 Thanks to Caroline Jarvis for sharing her wonderful photography. Wishing Danette & Justin all the best for a bright future together.